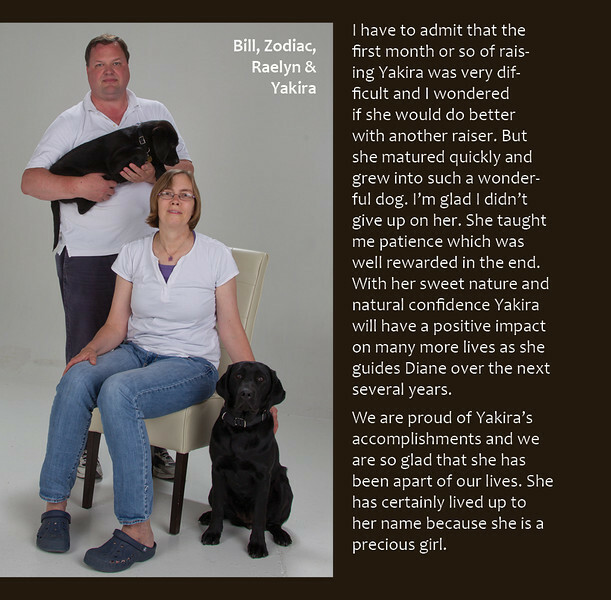 I have to admit that the first month or so of raising Yakira was very difficult and I wondered if she would do better with another raiser. But she matured quickly and grew into such a wonderful dog. I’m glad I didn’t give up on her. She taught me patience which was well rewarded in the end. With her sweet nature and natural confidence Yakira will have a positive impact on many more lives as she guides Diane over the next several years. We are proud of Yakira’s accomplishments and we are so glad that she has been apart of our lives. She has certainly lived up to her name because she is a precious girl.